Photography means drawing with light. searching for a wedding photographer, one of the questions you must ask is if they are proficient in off camera lighting. There are times during the day when a firm knowledge of light is of the utmost importance. 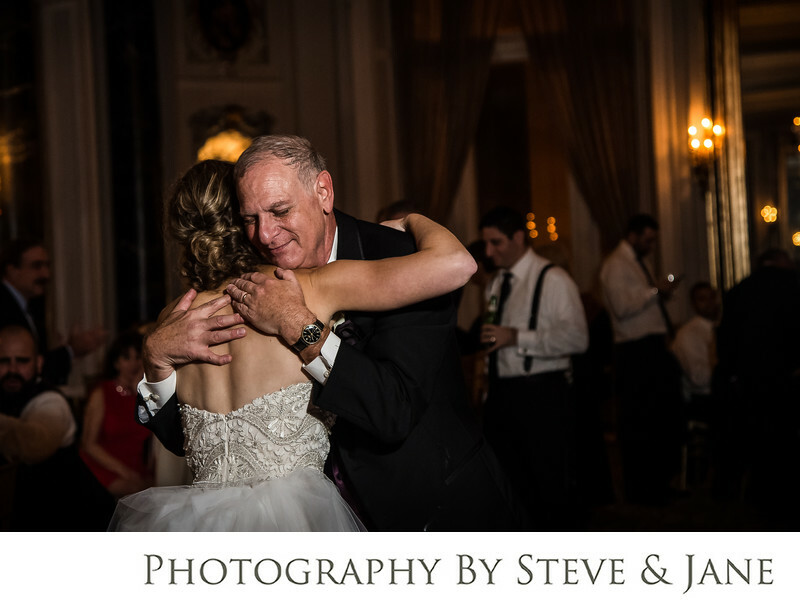 Inability to properly light a reception could mean your photographer will miss important moments like this father embracing his daughter during their dance. As experts in light, whether midday sun or a dark ballroom, we can quickly access any situation and create beautiful images during these fleeting moments. We have the knowledge, the experience, and the equipment so you can relax and know that your photos are going to be beautifully lit no matter what location you choose. From luxurious dramatic ballrooms, historic homes, barns, vineyards, museums and galleries, along with opulent churches, we have captured all these types of venues in the DC and surrounding Maryland and Virginia areas. And we would love to get to know you and capture your day as well. Contact us at info@steveandjane.com or 410-903-7590 to set up a time to meet in our studio.